Madrid is not only one of our favorite cities in Spain, but in Europe as a whole. It’s the place where we began our travels and a city we’ve dubbed our “European home base”. As the third largest city in the European Union, there are plenty of things to do in Madrid. What we love about Madrid is that it’s a great place to travel slow. There’s always an event going on in the livelier neighborhoods of Lavapies and La Latina, and there are plenty of shops and places to explore after seeing all of the tourist attractions. However, if you only have a few days in Madrid, here are the staple places to see. Madrid has two major plazas, one being the Plaza Mayor. The Plaza’s original use was to host celebrations, executions, and bull fights. Now, it functions as a major tourist square with shops, cafe’s and an information center. The other main plaza in Madrid is Puerta Del Sol. Most of the metro lines run through Sol because it is in the center of the city. In the square are many higher end shopping areas, and the notable statue of the bear and the strawberry tree. This is a symbol of Madrid and is a good place to snap postcard photos. 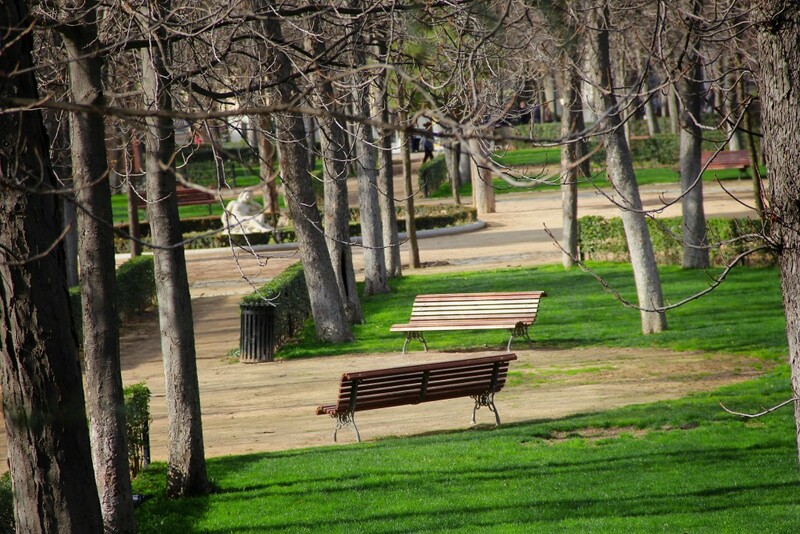 Madrid isn’t known for its abundance of parks, but the ones it does have are pretty amazing. Our favorite, and one of the most well known is Retiro Park. The 350 acred park has dozens of sculptures, walking paths, and even a lake with row-boat rentals. Retiro is a great place to spend an afternoon relaxing and listening to buskers play music. To get the very best view of Madrid, it’s worth paying the €5 to take a ride on the Teleferico cable cars. The cable cars run to Casa de Campo, which is a large park with a zoo, amusement park, and walking areas. 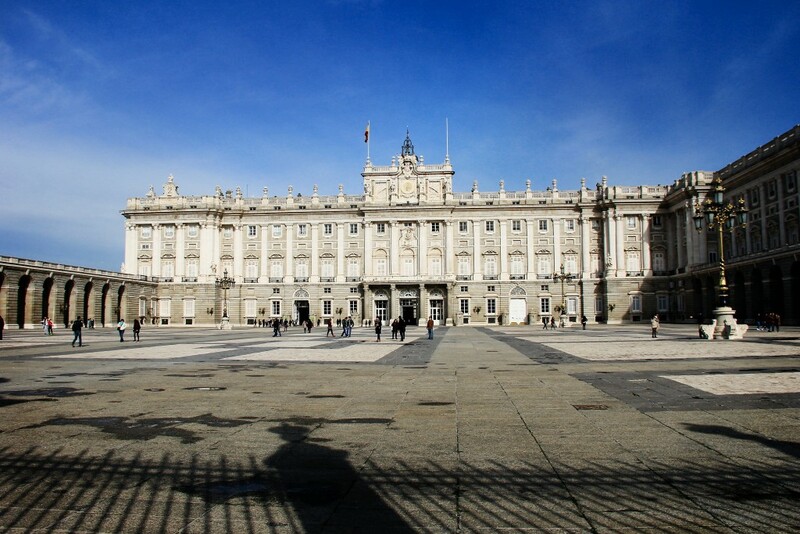 Right next to the Almudena is the Royal Palace of Madrid. Though originally made to house the royal family, they now opt to live in a quieter part of Madrid. Spain has many beautiful castles, but this one is the largest royal palace in Europe with over 3,000 rooms, but is primarily used for major events. Foodies, this should be your number one item for things to do in Madrid. San Miguel is an indoor gourmet tapas market filled with food stalls. Whether you’re craving desserts, olives, traditional tapas, or fish, San Miguel has it all. Be warned, this has become a major tourist area and there aren’t many locals here, but the food is good! For those looking for a more local experience, try visiting the San Fernando market instead. Those who visit Madrid can also visit a piece of Egypt! 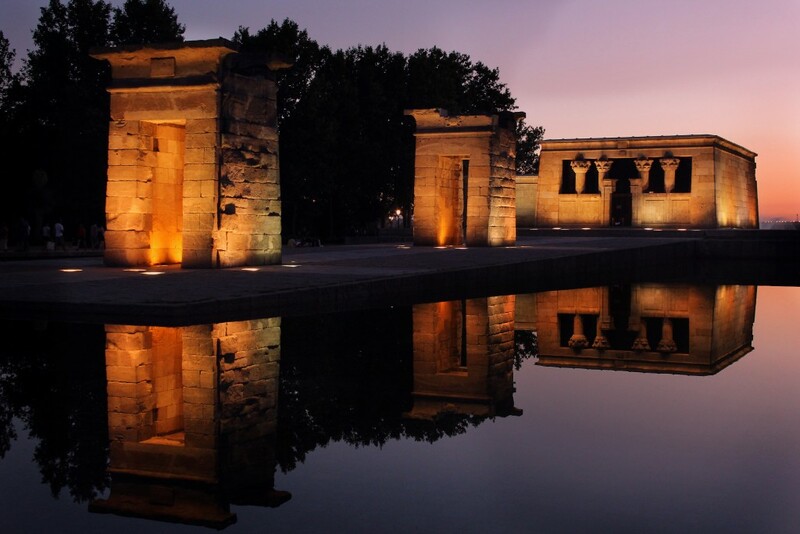 The Temple of Debod is an Egyptian shrine dismantled and sent to Madrid for safe keeping in the 1960’s. As a sign of gratitude, Egypt permanently gifted the temple to Spain a few years later. Every Sunday, El Rastro Market stalls pop up and cover several streets in Madrid. Locals sell a variety of clothes, bags, trinkets, and souvenirs. The market is open for a few hours in the morning and then shuts down, so plan ahead for this one! When the capital of Spain was moved from Toledo to Madrid, the need for a cathedral arose quickly. Thus, the Almudena was constructed. 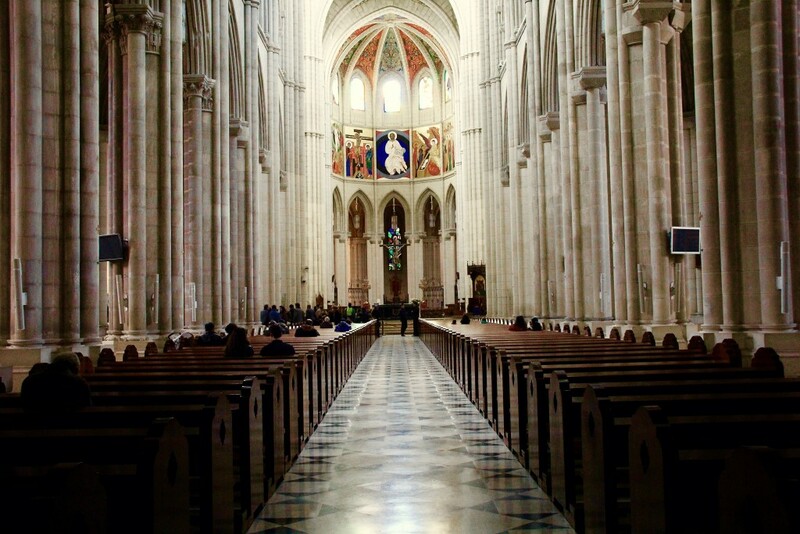 It took over 100 years to build the Almudena, and the modern cathedral is a must-see when visiting Madrid. Gran Via is the shopping mecca of Madrid. Row after row of shops line the street and this area of town is bustling at all hours. Soccer, or “futbol” is very big in Madrid. The Real Madrid football team practices and plays at the Santiago Bernabéu Stadium. If you can plan a trip overlapping a game, it’s is an experience worth having. Madrid is in the process of creating a coffee scene, and has many grab and go cafe’s that line the streets of Madrid. We did discover a few gems during our month stay there, and frequented the following cafe’s. This is the place to be for anyone who is working and traveling. Visitors can expect designated work tables, free water, free wifi, and a great menu of hot and cold drinks. Many people work from their computers while snacking and conversing. 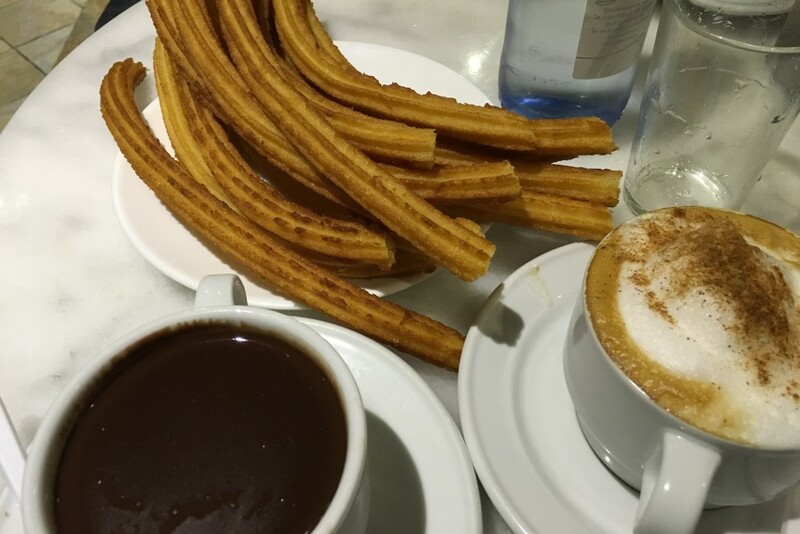 For a staple restaurant in Madrid, head to Chocolateria San Gines. This place is known for having amazing churros and chocolate, and is open 24 hours. Lines are long during mid morning, so come early or late to avoid a queue. Mornings in Madrid are a little slow, and most shops and cafes don’t open until after 9am. An exception to this is Paneria. Close to Retiro Park, this cafe is the perfect place to go in the early morning hours before the city wakes up. Paneria’s croissants are perfectly fresh, and they have a nice breakfast menu with coffee and pastry combos. Gluten free people, this cafe is for you. The cafe has an abundance of cakes, cookies, pastries, and of course, coffee. As one of the few all gluten-free places in Madrid, Celicioso does a great job catering to those with a gluten intolerance while still delivering excellent food and a nice atmosphere. One of the best things to do in Madrid is enjoy the tapa experience. Tapas are small plates of food served with beer or wine, and are the major cuisine in many Madrid restaurants. Quality and prices of tapas vary, and we’ve listed some of the ones we like below. This place rocks because of the size of their plates. A tapa and a drink only cost €1.50, and the portion sizes make the deal even sweeter. With cozy, rustic decor and more food than many can eat, Las Brasas is a great place to start an evening of tapas. Montadidos is a chain in Madrid and can be found almost anywhere throughout the city. Known for their inexpensive tapas, Montadidos has an easy order system. Visitors write down which tapas, desserts, and drinks they’d like, then turn it in to the waiter and pay. The food is brought out all at once for an enjoyable tapas feast! For a more spontaneous and authentic experience, take the metro to the La Latina barrio. Those walking around La Latina at night will be hard pressed not to find an enjoyable tapas restaurant. La Latina has a bustling nightlife scene and plenty of streets lined with tapas restaurants. Come with a hungry stomach and try anything that looks good! There are many places to eat and things to do in Madrid, and visitors on all types of trips will enjoy their time in the Spanish capital. Madrid’s main sites can be seen in a few days, though our biased opinion says to stay as long as possible! This list should give visitors a great starting point to understand the city, but the best way to explore is to try new places! What are your favorite things to do in Madrid?